New Zealand has one of the highest rates of melanoma in the world. Melanoma occurs when cancer forms in the cells that produce pigments for our skin, hair and eyes, and can look like funny shaped moles. The most common form is skin melanoma. Some melanomas form quickly over weeks, while others can be slower to develop. Melanoma is easily treatable if detected early, but if ignored, it can spread cancer to other parts of the body and become impossible to get rid of. Melanomas usually look like funny shaped moles. They can be raised, or itchy, or bleed. Colours – The mole will have a number of colours, usually black, brown and tan. Melanomas can also be grey, white, red, pink or blue. Diameter – The mole will usually be bigger than 6mm across (slightly larger than the end of a pencil). If you are concerned about any moles or freckles, you should get them checked out by a doctor ASAP regardless of whether they have all the above characteristics. Melanoma is common from about age 25, and your chances of developing melanoma increase as you get older. 90% of melanoma cases can be linked to over-exposure to UV rays throughout your life – getting sunburnt, spending a lot of time outdoors, or UV exposure from sun beds. People with a family history of melanoma are more at risk, so if you have family members who have had melanoma, you are more at risk. People with fair skin are more at risk of developing melanoma. Maori and Pacific Islanders therefore have very low rates of melanoma. Older men are particularly prone to ‘nodular melanomas’, which look like raised firm moles that form on the head and neck. If you are concerned about any moles on your skin, see your doctor immediately. Your doctor will examine the mole through a magnifying glass and look for the tell tale signs of melanoma. If melanoma is suspected, your doctor will usually organise to have the mole removed, along with a small area of surrounding skin, which will be tested for cancerous cells. Depending on the results, you might have an MRI, ultrasound, blood tests or further biopsies to see if the cancer has spread. In New Zealand it’s very common to have funny looking moles removed as a precautionary measure. If the biopsy comes back positive, you’ll need a second biopsy to make sure all the cancerous cells were fully removed. If the cancer is in the later stages and has spread, your doctor might discuss radiotherapy, chemotherapy or medication. Wayne Johnston (65) from Waiheke Island went to the doctor five years ago to get an unusual looking mole on his back checked out. His doctor diagnosed melanoma and used a dye injection to see if the cancer had spread. It had. 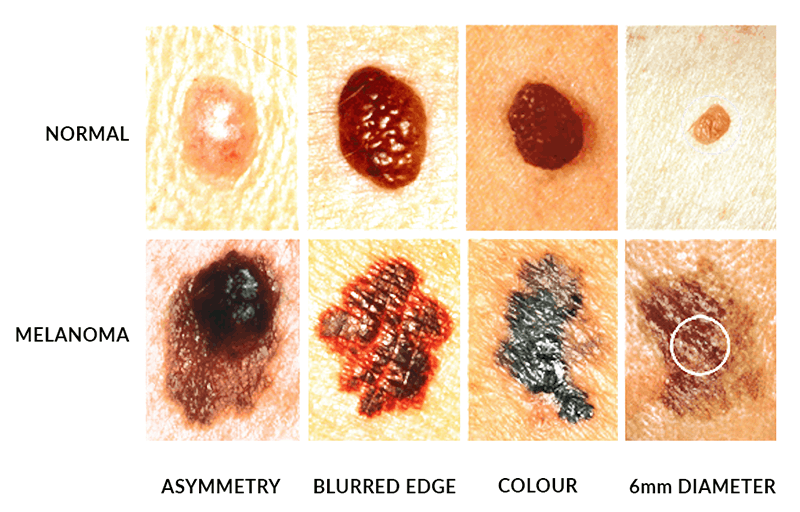 Here are some helpful links to more detailed information about melanoma. Here are some useful brochures and resources that you can download for more information on Melanoma. If you would like to share your story about beating melanoma we’d love to hear from you. Fill in the form and we’ll get in touch.